Emily Paulson can feed 200 people for 15 bucks. So what have you done lately? This is the one-woman social-services dynamo known as Emily Paulson? This is the single mom who not only coordinates the Campus Kitchen program (323-6939), which distributes Gonzaga food services’ excess food to the needy, but also finds the time to run a Thursday-night dinner for the homeless along with a whirlwind of other charitable food projects? Paulson’s a generous buccaneer, then: “She has distributed something like 10,000 pounds of food,” Thorpe says. Don’t make assumptions about people: It’s the theme that keeps coming up when you spend time with Paulson. Don’t assume that you know how generous (or selfish, or needy) anyone is. She gathers food from restaurants, grocery stores, food banks and Gonzaga’s various cafeterias, then gets involved personally in the cooking, freezing, preparing and packaging of meals for the elderly, the disadvantaged and the homeless. When Todd Dunfield, assistant director of CCASL, is driving along downtown streets with Paulson, he says she’ll blurt out, “Hey, there’s one of my guys!” — the guys who attend the dinners that Paulson organizes. “My people,” she calls them. Ten minutes into our conversation and she’s weeping. She apologizes, dabs her eyes. “My students know this about me — I’m a crier,” she says, then leans forward aggressively in her seat. Instead, Paulson has decided, it’s her place to feed — and she could use some help. Because there are prosperous restaurants and wealthy people around here who donate extensively to Paulson’s efforts — and there are those who don’t. Paulson is passionate about gathering more into her charitable fold. She pauses to let that sink in. “No one should be hungry in Spokane,” she says. “If people just opened their eyes and got creative….” Her voice trails off. My philosophy on life is: I believe people are inherently valuable just for sharing the condition of being human. There are no “throwaways” and you don’t get do-overs, so I would like to do as much good as I can while I am here. Why I give back: I think it is our duty as members of this community to ensure the well-being of all of its members. Making sure the basic needs are met for all people makes Spokane a healthier community as a whole. I wish… that the people who have the least weren’t always the ones giving the most. I wish more people viewed housing as a right. And I wish people with deep pockets would be as sickened as I am about people going hungry or without the most basic of necessities. I look up to: My friend Kimberly Dunham at the Satellite. I can honestly say without hesitation that she has the biggest heart of anyone I know. She is a beautiful person inside and out. Right now, she’s devising tonight’s “relatively slow” meal deliveries. Nine styrofoam containers for some of the elderly at a Catholic Charities retirement home. Paulson portions out the casserole; an intern locates three cans of corn; a bag of cookies takes care of dessert. She sprints through Gonzaga’s kitchens in search of a food-service employee — could they spare any salad? A trip to a giant freezer yields a box of bagged salads — and could she grab a big jar of ranch dressing, too? Thanks so much. Now that those meals are done, it’s time to warm up two large trays of lasagna, hop in Paulson’s car and zip over to the American Indian Community Center. “I tell people, ‘I need a siren on top of this Jeep,’” she says. “I gotta get this food to people — and I gotta go here, and then there, and it has to be at this temperature. “There’s not much room for error,” she says. I hang on as she careens off Second Avenue. We’re an hour early for her Community Dinner, but men are already wilting in the afternoon heat as we pull into the parking lot at First Covenant Church. Paulson has helpers in place in the kitchen and chow line. Tonight’s gathering requires only about 35 meals; toward the end of the month, when food stamp money runs out, demand soars to 150. It’s a gathering filled with men and women and families who have disabilities, can’t keep a job, just need a break — people like Jim, who has ideas for improving food-service procedures at various local charities, and Rand, who wants to get into computers. Every year, our Philanthropy Issue celebrates those organizations and individuals who answer the call — who give of themselves every day for the betterment of the community. The Peirone Prize, founded by Jeanne Peirone McGregor and Jim Peirone to honor their parents, is our family’s way of saying thanks to some of those people. Our criteria for the prize is that you be making a difference here at a relatively young age (40-ish and younger). We accepted nominations from local leaders in the nonprofit world and came up with 48 great candidates. Philanthropy Editor Leah Sottile, Managing Editor Jacob Fries and I narrowed the batch to 15, and finally settled on our three winners, who you will meet here on Inlander.com. This year, each winner will receive $500. 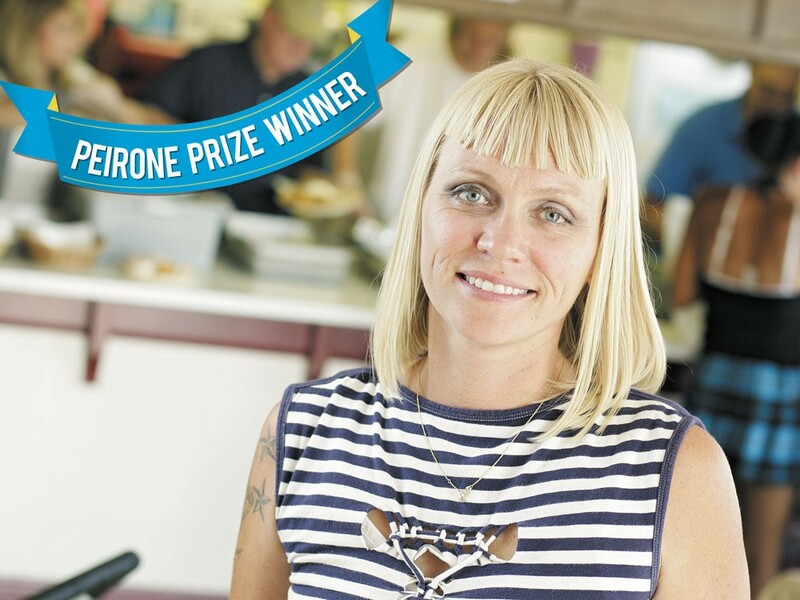 In coming years, as our Peirone Prize endowment grows, we’d like to add more winners or increase the size of the cash prize. (Read more about the Peirone Prize.) – TED S. McGREGOR JR. Send your Peirone Prize 2011 nominees or thoughts on this Give Guide section to giveguide@inlander.com.